PonoRevealer lets you compare AAC, MP3 and high-res tracks | What Hi-Fi? Neil Young has revealed a new feature for his PonoPlayer, which will allow you to hear for yourself the difference between high-res audio and lower bitrate tracks. You need to download the latest version of the Pono desktop software to access the feature, PonoMusic World version 20.0.100, before connecting your PonoPlayer to your computer. The latest firmware update for the PonoPlayer (v.1.0.6) will then download, giving you access to the PonoRevealer and offering you a free sample track - you'll never guess who it's by - in order to test the feature. A new tab is then available on your music player, the Revealer tab, under which you'll find your free track, Neil Young's Heart of Gold (you guessed, right?). This will begin playing in MP3. You can then opt to switch between a choice of five different formats and resolutions - MP3, AAC, 16-bit/44.1kHz, 24/96 and 24/192. 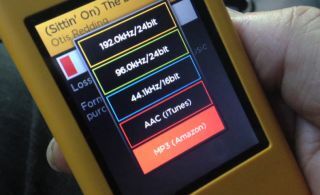 Pono claims the MP3 represents the quality of an Amazon download, while the AAC track matches the sound quality of an iTunes download. You then have CD-quality resolution and two high-res options - 24/192 being described as 'Lossless Extreme Studio Master Quality' - as sold on Pono Music. You can also create PonoRevealer tracks from your existing library, making copies of your tracks (the higher resolution the better, naturally) so you can hear the difference. You can remove these extra songs on the Pono desktop software. Neil Young revealed the PonoRevealer in a short video, and PonoPlayer owners have since been notified of the new feature via email. Last year rumours suggested some Pono executives couldn't hear the difference, seeing high-res audio as purely a marketing tool. Hopefully they're the first people in line to give the PonoRevealer a try. You can read more about the new feature on the Pono website.